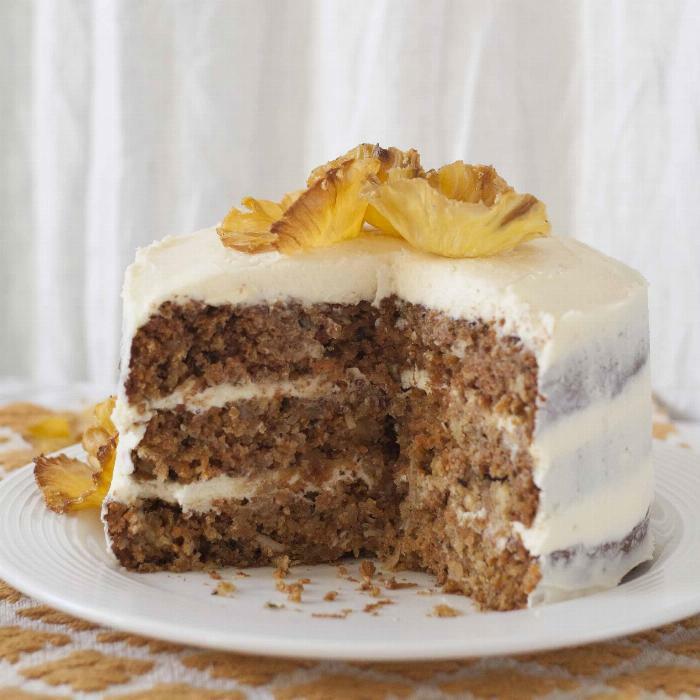 A moist carrot cake laced with pineapple and coconut and topped with cream cheese frosting and pineapple flowers. 2Preheat the oven to 350 degrees. 3Butter (3) 8-inch round cake pans*** then line with parchment paper and butter and flour the pans. 4In the bowl of an electric mixer, beat sugar and oil. 5Add eggs one at a time, beating well after each addition. 6When the batter is light yellow in color, add the vanilla. 7In a separate bowl, whisk together flour, cinnamon, baking soda, and salt. 8Add the dry ingredients to the wet batter. 9Fold in walnuts, coconut, carrots, and pineapple. 10Divide batter between the three pans and bake for 45 minutes or until a toothpick inserted in the center comes out clean. 11Cool the cakes slightly, carefully remove from pans, then cool completely on wire racks before frosting. 13Beat the cream cheese, butter, vanilla, and salt with an electric mixer until combined. Slowly add in the confectioners' sugar, mixing until smooth and creamy. 15Preheat oven to 225 degrees. 16Line two baking sheets with parchment paper. 17Cut off the top and bottom of the pineapple, then slice the skin off the sides, trimming away the black “eyes”. 18Cut pineapple, crosswise, into very thin slices and gently place on prepared baking sheets. 19Bake until tops look dried, about 60 minutes. 20Flip slices and bake until completely dried, about 60 minutes more. 21Pinch the center of each pineapple slice to form a cone and allow to cool, inserted into a clean egg carton, muffin pan, or shot glasses to form flowers. 23Carefully trim the rounded top off of each cake layer using a cake leveler or serrated knife to make a level surface. 24Place one cake layer on serving plate and pipe frosting onto it using a pastry bag or zippered bag with the tip cut off. Carefully spread the frosting around with an offset spatula or butter knife. 25Continue this method with the next two cake layers, then lightly apply frosting to the sides of the cake by piping vertical stripes and then spreading out the frosting. 26To get that semi-naked look, hold the edge of a bench scrapper against the cake and wind it around using gentle pressure to scrape off excess frosting until you reach the desired effect. 27Decorate the top and/or sides of the cake with the dried pineapple flowers. Grate carrots with a box grater by hand or using a food processor fitted with the grating blade. ** For the frosting, use 2 of the brick packages (the full 16 ounces) if you want the cream cheese flavor to really shine through. Cut it back to 12 ounces (1.5 bricks) if you want a sweeter frosting. *** This recipe makes enough for (3) 8” round pans, (2) 9” round pans, or (1) 9x13” rectangular pan. Adjust the baking time accordingly.